Get information on the Hill Stations in Kullu, Kullu Hill stations, Hill Resorts in Kullu, Kullu Hill Resorts, Resorts in Kullu, Hill stations in India, Kullu tourism, Kullu Tour Packages, Travel to Kullu, Tours of Kullu, holiday in kullu. 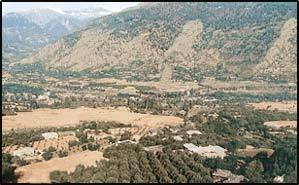 Capital town of the Kullu District, in the state of Himachal Pradesh, the hill station of Kullu is located along the banks of the Beas River in the Kullu Valley at around 10km northwards of the airport at Bhuntar. Sprawled amid the fascinating Kullu valley, it has the mighty Himalayas for its backdrop. The several temples and the yearly Dussehra festival attract huge number of tourists both in the form of devotees as well as sheer travelers. Kullu gives you major options of tourism as there are numerous tourist attractions in Kullu and around the town as well. The scenic beauty of the place will prove to be the main attraction on your tour to Kullu. Set amid the lower base of the Himalayas, this small town offers breathtaking views of valleys like Ani, Manikaran, Korpan, Lug, Banjar, Garsa, several apple orchards, and the imposing Himalayan ranges all of which go on to create a captivating atmosphere for the tourists. Kullu is well-known for its temples and festivals. The main tourist interest of Kullu is the Raghunath Temple, devoted to Lord Ram, who is one of the important deities of the Hindus in general and the patron deity of the whole Kullu valley. It was built by Raja Jagat Singh, the former ruler of Kullu, in 1660 to amend for his sins. He got an idol of Lord Ram from Ayodhya and established it within the premises of this temple. Jagannathi Devi Temple or the Bekhli temple is at a distance of 3 km from Kullu and is sited in the village of Bekhli. It is a steep 1� hour ascent to the temple, but it provides a wonderful view of Kullu which is worth the climb. Among the festivals celebrated widely in Kullu are Malani, Phalguni, Shahri Jatra and Birshu. Kullu Valley, also referred to as the �Valley of Gods�, is renowned for the seven day festival of Dussehra, a festivity of the mythological Lord Rama�s victory over the evil king Ravana. Kullu is also a major hub of Himalayan Adventure Sports activities. Kullu Valley is recognized all over the world for Heliskiing. This sport is generally arranged near Bhrigu peaks in the Hamta pass. Solang Nala is also another convenient venue for the sport. You can enjoy the thrill of river rafting through the rough waters of River Beas. Other places of tourist interest in the region include Manikaran and Vashisht village near Manali (hot water springs) at 40 km north of Kullu. Malana, Kaish-Dhaar in Lug Valley, Bijli Mahadev, Bhekhli and Bajaura are dotted with the famous temples of the area. Towards the north lies the eminent town of Manali, which leads onto the Lahaul and Spiti Valley through the Rohtang pass. Log on to www.touristplacesinindia.com which gives online information on Kullu on your tour to India.